You must first create an IDex Directory entry in Services > Authentication > Directories, and have mapped the Smoothwall user groups to the directory's group names. For a detailed description of how to do this, see Configuring an IDex Directory Connection. 2. From the IDex Client and Agent Software list, download the IDexAgent_x86.msi (for Windows 32-bit) or IDexAgent_x64.msi (for Windows 64-bit) installation program to a shared network location. 3. Double-click the relevant installation program — IDexAgent_x86.msi (for Windows 32-bit) or IDexAgent_x64.msi (for Windows 64-bit). • Web filter host — Enter the hostname or IP address of the Smoothwall configured for communicating with the IDex Agent for which an access rule for IDex cluster has been configured. • Web filter port — Use default Port 2948 for most implementations. 8. Click Install to begin installation. Note: A reboot is not required to complete the installation. Nor will the user see an icon in the system tray for the IDex Agent. You can create an unattended installation to deploy the IDex Agent out to active directory domain controllers. This section only provides guidance particular to the IDex Agent. Note: A reboot is not required to complete the installation. You will not see an icon in the system tray for the IDex Agent. Using an Active Directory Group Policy Object (GPO), you can create an unattended installation to deploy the IDex Agent out to active directory domain controllers. This section only provides guidance particular to the IDex Agent. For a detailed description of how to setup such a GPO, refer to your Active Directory documentation. From the IDex Client and Agent Software list, download the IDexAgent.msi installation program to a shared network location. 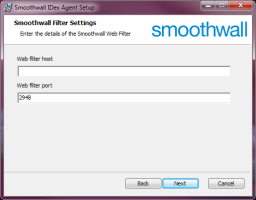 SmoothwallIPAddr String Hostname or IP address of the Smoothwall explicitly configured for communicating with the IDex Agent. From the Smoothwall administration UI, go to Network > Firewall > Smoothwall access. Move this rule above any block rules you have in place in the Smoothwall access table. For a detailed description of how to create Smoothwall access rules, see Configuring Smoothwall Access Rules. From the Smoothwall administration UI, go to Web proxy > Authentication > Policy wizard. Non-transparent or Transparent — Choose the type of authentication suitable for your organization. Our knowledge base articles, Using Transparent Authentication Policies and When to use Non-Transparent Authentication Policies provide a detailed description of both. For a detailed description of how to create web filter authentication policies, see Creating Authentication Policies. The IDex Agent writes any connection errors to the Application event log (Control Panel > Administrative Tools > Event Viewer > Windows Logs > Application) of the Windows device. Log entries are prefixed with "IDexAgent".